Andrew Wiggins and Co., opened camp Friday at the Air Canada Centre in preparation for the FIBA Americas Olympic men's basketball qualifying tournament that opens Aug. 31 in Mexico City. Jay Triano called it the most talented group of Canadian basketball players ever assembled under one roof. Andrew Wiggins and Co., opened camp Friday at the Air Canada Centre in preparation for the FIBA Americas Olympic qualifying tournament that opens Aug. 31 in Mexico City. With 10 NBA players in Canada jerseys, it's the realization of months of anticipation for this young, talent-laden team. 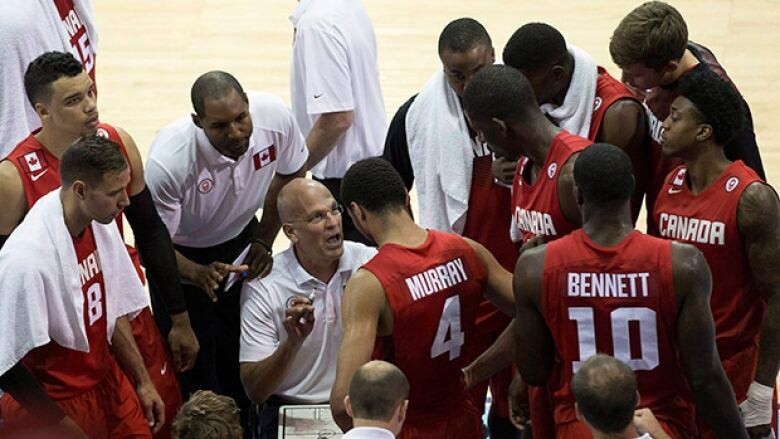 "Our pool of players is deep," said Triano, Canada's head coach. "So it's exciting, but we've got a long ways to go as far as learning the international game." The Canadians are gunning for their first Olympic appearance since Steve Nash led the squad in a thrilling run at the 2000 Sydney Games. Nash is now the GM of the team that must finish first in Mexico to book a berth in Rio. Wiggins, who's coming off NBA rookie of the year honours, said the Olympics has always been a goal of his. "I'm doing it for pride, for Canada really. I want to be in the Olympics, something that I haven't got a chance to witness or experience," said the 20-year-old from Vaughan, Ont. "So that's what I'm looking forward to really, just trying to win this, to qualify to make it to the Olympics." Wiggins, who was sporting a new 'do of tiny braids, believes the Olympics are within reach. "With all the talent we've got, I believe we're the best team," he said. "We've just got to go in there and fight. We were the last team to get together, so we've got to work hard in practice, get the chemistry built, and go out there and give it our all." Wiggins, Anthony Bennett, Sim Bhullar, Melvin Ejim (who recently signed with Orlando), Cory Joseph, Andrew Nicholson, Kelly Olynyk, Dwight Powell, Robert Sacre and Nik Stauskas make up Canada's NBA contingent. Of the 15 players in camp, Triano will have to cut four before the tournament. The Canadians are facing a gruelling schedule in Mexico, and so their depth and youth will be huge. Each country has one day off during the tournament — Canada's day off falls on Day 1. So if the Canadians go all the way to the final, they'll have to play 10 games in 10 days. "Our strength is our youth, and our weakness is our youth," Triano said. "We've got to use it to our advantage and we've got to make sure that we turn it into a positive with high energy and the way we approach every single game. But we're infants as far as the international game is concerned and knowing the tricks of the trade." Still, Canada will arguably be the deepest team in the tournament. "That's our advantage," Triano said. "When you think about a team like Venezuela, if we play them on, let's say Game 8 out of nine days or 10 days, we hope that (Greivis) Vasquez has had to play 38 minutes a game, whereas our guys have played 20 minutes a game and we're fresh and ready to go," he said. "We think that the strength in our country and in our youth is going to be that we can play shorter minutes because of our depth and at a higher level because of our youth." The 24-year-old Olynyk, who's coming off his second season with the Boston Celtics, said wearing the Maple Leaf is an entirely different experience than playing in the NBA. "There's a lot of pride playing for your country, a lot of emotion, passion that you sometimes don't see at different levels, because you can get traded any day. . . it's different to really feel attached to one place in the NBA if you're just bouncing around," Olynyk said. "But with Canada, obviously they can't trade me to Germany, they can't trade me to Argentina. "So for me or the next guy, when you're out here for your country, it's something very powerful, that passion, that love of the game and just fighting for your country, getting your country to that plateau." One notable absence is Cleveland forward Tristan Thompson, who's been in contract negotiations this summer. Jamal Murray is in camp, but might not receive clearance to play from the University of Kentucky, where he's headed next season.